Any big plans for tomorrow? We watched The Amazing Spider-Man here today and will hopefully go to the movies to see the new one tomorrow. I've heard so many good things about it, I can't wait! So today I have the Arcane Lacquer Soft Pulses collection to show you : a set of 6 polishes, 3 neutrals and 3 darker/vampy colors. Formula and application were nice on the entire collection. They did all require 3 coats for complete coverage and full depth so that's what I used in all of my swatches. Made of Scars is a pastel grey creme with pink shimmer but also white flakies and silver holographic micro glitters. A soft and really pretty color. State of Grace is a light taupe creme with a strong gold shimmer, orange/green flecks and gold flakies. I've always loved taupes and this one's quite unique. Ambulant Heart is a cool baby pink with silver shimmer, pink dots, silver holo squares and silver holo micro glitters. Another nice and delicate pastel. 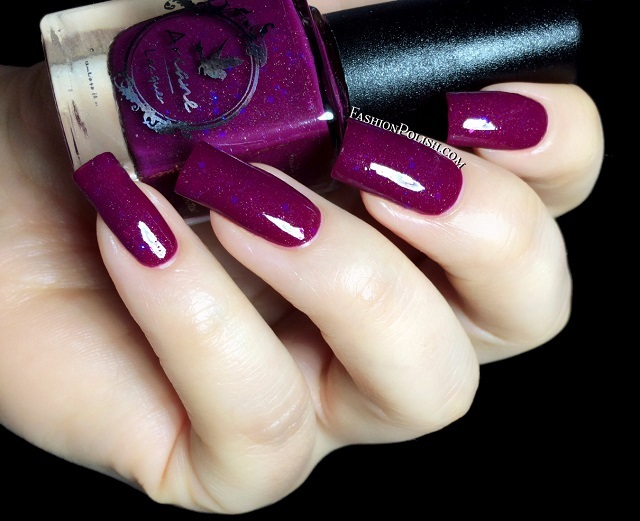 Seemless is a deep plum pink with holo micro glitters, purple iridescent hexes and a subtle pink shimmer, beautiful! Anti Gravity is a dark blue jelly with green shimmer, green flakies, blue/green glass flecks and blue holo micro glitter. Now this is well into my comfort zone! I loved how all the particles played with the light in this particular color. Absent Are The Saints is a blackened blue jelly with a mix of gold, green and orange shimmer and also pink and blue micro glitters. This one looks black 90% of the time but all the shimmer and glitters were visible even under low lighting. I really liked this first experience with Arcane Lacquer. The neutrals vs vampies concept is fun and allows everyone to find something they like. I think I would have preferred them to be fully opaque in 2 coats but I guess the glitters and shimmers would have been lost in that case. My top picks : State of Grace, Made of Scars, Seemless and Anti Gravity. Anti Gravity!!! 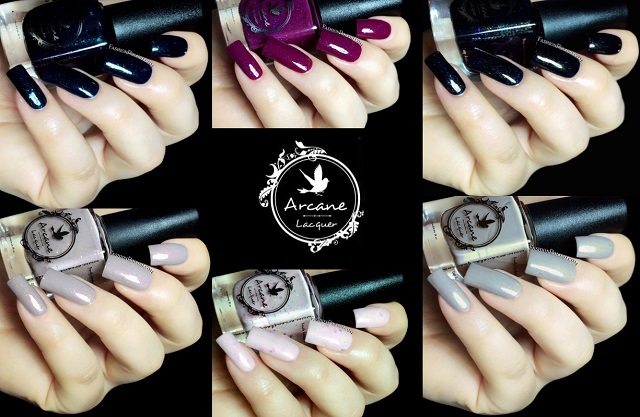 Arcane Lacquer is a 3-Free Australian indie brand that can be purchased on Etsy but also through many worldwide stockists, includinh Harlow&Co and Llarowe. 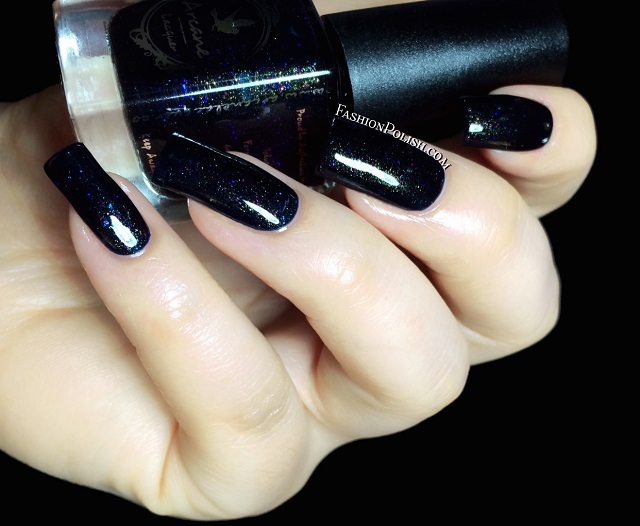 Have you ever tried Arcane Lacquer? Don't you find the Aussie indie scene particularly amazing? I do!